There isn�t much you won�t love about The Blue Train. From the moment you step into the pre-departure lounge, it�s quite obvious that this is going to be a journey unlike any other. 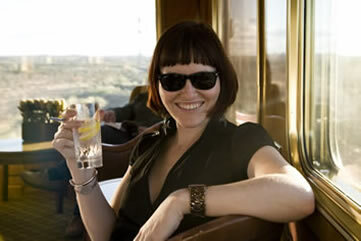 Bridget McNulty takes us behind the scenes on one of Africa�s most luxurious train journeys. How right she was. Once your butler has shown you to your room, you�ll be treated to a welcoming letter, perfectly chilled Simonsig Ros� champagne, and a fresh fruit platter. During the day, your suite has a couch, chair and writing desk, and more than enough space to move around in. 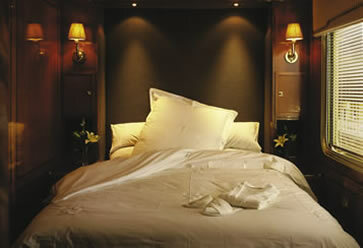 At night, the couch is converted into a double bed with fine linen, and space becomes a lot� cosier. Still, with high ceilings and a large panoramic window through which to watch the world go by, it doesn�t feel cramped. In fact, it feels delightfully luxurious, a cocoon of comfort with giant windows to let the outside in, and the reassuring rumble of the train constantly in the background. If you want to see where you�re going, there�s a live feed connection to a driver�s eye-view camera that feeds into the television in your suite, but you�re more likely to stare out the window for hours, as the uniquely South African views roll by. The d�cor is old-fashioned, but classic � all golds and browns, lots of leather, plenty of wood panelling. There are proteas in vases everywhere (although I was disappointed to note that they were fake proteas � not in keeping with The Blue Train�s proudly South African spirit at all). The artwork is predominantly of African flora and fauna, and quite forgettable, though pleasant. 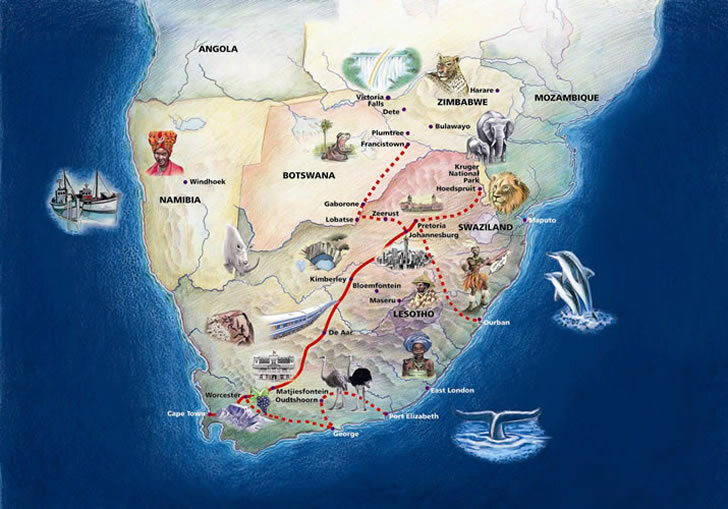 You�ll have an hour or two to settle into your suite, soak up some of the scenery flashing by (once the outskirts of Cape Town give way to the stunning Hex River Valley you�ll want to be glued to your window) and possibly explore the train a little. The dining room and lounge are right next to each other, and drinks and snacks are served in the lounge all day. It�s remarkably relaxing. There really is nothing to do except sit back and unwind� and eat. You might find that most of the trip is about pacing yourself between meals! Brunch / lunch is served in two sittings if the train is full or, as with us, at a combined sitting if the train is only half-full. There are a number of options to choose from, and it�s all served with silver cutlery, crystal glassware and great style. The service on the train is impeccable, to put it mildly. Your butler is only ever a phone-call away, and can be at your door in under a minute with anything your heart desires. The waiting staff were friendly, discreet and ever-ready, and the bar staff were intuitive and well-trained. You get the sense that no matter what it is you ask for, it�s never too much trouble to get it to you as quickly as possible. 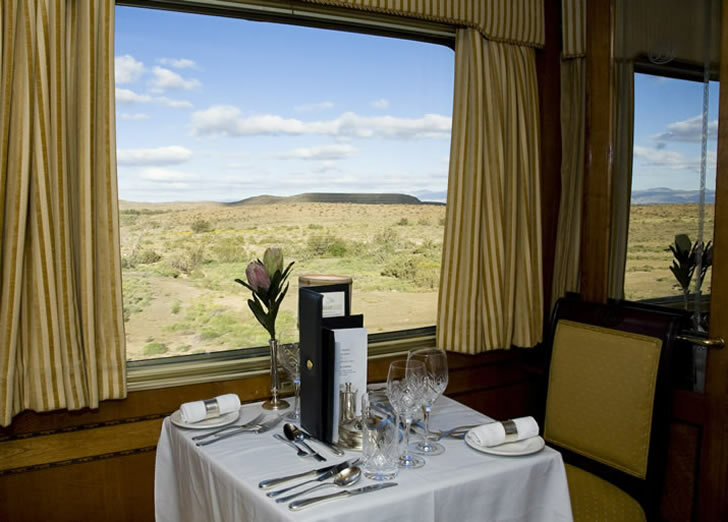 After lunch there�s time for a lie-down before the train pulls into Matjiesfontein for the daily excursion. It�s a fun affair � 45 minutes in the charming historical village of Matjiesfontein, with a hilarious ten minute tour on an old English double-decker bus, and a glass of sherry in the Lord Milner hotel (the sherry glasses are engraved, and a memento for each guest to keep). You�ll want to tear yourself away in time for dinner though, and make sure it�s before (or after) 6.30pm, when the train stops to refill all water tanks, and the water is switched off for a few minutes. Spend some time in the surprisingly spacious bathroom (with rare Gialo Royale Italian marble and 24 carat gold plating on all fittings) and you�ll be ready for dinner � an elegant affair. Known as �the highlight of your journey�, you won�t be disappointed. We chose the Grilled Queen Prawn and Fresh Avocado Salad, which was simply delicious, followed by the Rack of Karoo Lamb served with rosti potatoes, waterblommetjies and stir-fried vegetables, and the Grilled West Coast Sole with crisp new potatoes and a lemon and chive butter sauce. Both were excellent. Throughout the meal, your waiter is on hand � available but not hovering � to refill drinks, suggest wines, or take away plates. It�s unobtrusive but superb service. And the wine list is (not surprisingly) top class, with some of the best South African wines on offer. Fit in some cheese and biscuits if you have space, or head straight for dessert � a Chocolate Potjie (made out of Couverture chocolate, wonderful stuff) and filled with passion fruit mousse, or a classic Malva Pudding served with cr�me anglaise. 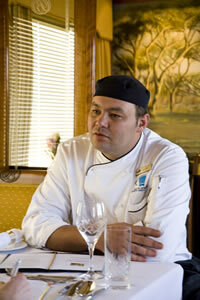 Although the food is plentiful on The Blue Train, they�re very clever when it comes to portion sizes. Meals are big enough so that you feel satisfied, but not so big that you feel over-full. Everything is so beautifully presented that you won�t want to rush eating, and by the time you�re finished you�ll feel perfectly satisfied. A difficult balance to strike, but one that�s well worth the effort. If you�re in the mood for a movie there�s a closed-circuit TV with a number of movies on offer, but you�ll probably be content to lie back and watch the night pass by outside your window, or listen to the hypnotic hum of the train as it carries you through the night. The last few precious hours on the train are spent wherever you choose � in the comfort of your suite, converted back into the daytime setting of couch and writing desk, or in the lounge, the Observation Car, or the club car � a gentleman�s pub atmosphere and the only place you�re allowed to smoke on the train. When you return from breakfast you�ll find a certificate and gift waiting for you, a tiny gold The Blue Train clock, a memento of your journey. It�s a journey you�ll want to remember, guaranteed. And then, all too soon, it�s over. The magical The Blue Train pulls into Pretoria Station, and the outside world comes rushing back in. I felt genuinely sad to leave the train � leaving behind a wonderful space of relaxation, luxury and, perhaps most importantly, the cessation of any everyday worries. When you�re on a luxury train making its way for 27 hours through some of the most stunning scenery in South Africa, it�s difficult to worry about anything� For that alone, I would recommend The Blue Train to everyone I meet. There�s very little about it you won�t love. Style Colonial elegance with a touch of African. Think wood paneling, gold plated lamps and leather armchairs, with proteas and African flora and fauna paintings as decoration. Setting That depends at which stage of the journey you�re at� From city to country to semi-desert and back to city. It�s an ever-changing vista outside your window, better than any artwork. 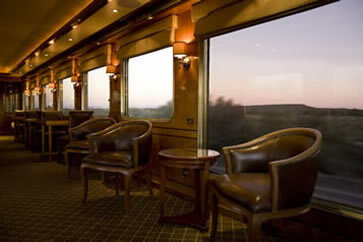 Why you'll love it The sheer opulence of train travel with 5 star luxury is a heady mix. With a butler on hand (all day and night) for the duration of your trip, there�s no need to want for anything. There�s absolutely nothing to do except relax� and eat. Good to know Dress code is smart casual during the day and elegant, suit and tie or traditional at night, and it�s strictly adhered to. All food and drinks, except French champagne and caviar, are included, but you�ll want to pace yourself so you can properly enjoy the three-course lunch, afternoon high tea and three-course dinner. Wow factor The food is excellent � it�s pretty much a gourmet eating trip. Lunch was Norwegian salmon, fillet and cr�me brulee, followed by afternoon high tea a few hours later in the lounge. And then, two or three hours later, it�s time for dinner! And then breakfast� Make sure you pack your appetite. 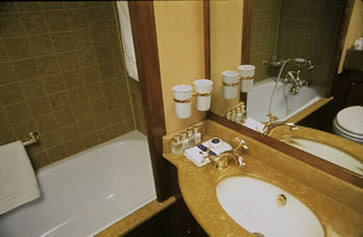 Best rooms or suites to book There are only two options on the train � the Deluxe suite or the Luxury suite. All suites are available either with twin beds and a shower, or double bed and a bath, but the luxury suite has about a metre more space. Room for improvement Overall, The Blue Train is grand and elegant, but there are a few small details that would make the experience even more impressive. None of the proteas are real � on the tables, in the suites and in the lounges � they are all plastic. The keyring for our suite was tacky, handwritten on a plastic key holder. And the audio was terrible quality � out of nowhere a loud voice would come crackling over the system, with loud African music in the background, speak abruptly and then cut off dead. How to Get There The Blue Train pre-departure lounges are located at the Pretoria Train Station and the Cape Town Train Station. Instructions are mailed to you with your booking. Taking time out from elaborate dinner preparations on The Blue Train, chef Allen Pfister took a few minutes to tell us why he loves his job. 1. 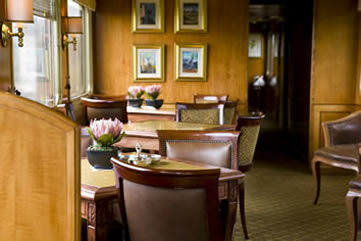 What makes dining on The Blue Train different? We try to give a taste of South Africa, with a modern twist. So, for example, we�ll serve the classic rack of lamb, but it�s Karoo lamb, and we serve it with waterblommetjies, which are uniquely South African. It�s recognizable, but with an unexpected twist. Our menu is also seasonal, which means we use only what is fresh and in season. 2. How is being a restaurant on a train different to a normal restaurant? Well, number one is space � my kitchen is tiny. But a chef is not limited by space, he�s limited by his imagination� It�s not the size of the space, but what you do with it that matters. Also, the rocking of the train is a factor � you learn to recognize it and stop what you�re doing till you�ve moved around the corner and the rocking stops. Then you can start again. You learn to deal with it, and never overfill your pots and pans! There�s also a little metal rail in front of the open flame burners to stop the pans sliding off, which is handy. 3. What�s your favourite dish to cook? Anything Thai � it�s a flavour explosion. Actually, anything from South-East Asia, there are such great flavours from that part of the world � fresh coriander, garlic, chilli, fish sauce � it�s a feast for the senses. 4. What�s your favourite dish to eat? Again, the same thing! I was born in the wrong country, obviously. We don�t cook a lot of Asian food on The Blue Train, because we try to keep it South African, but I do have things like sushi rice in my store room, so that when Japanese groups visit we can give them a little taste of home, to make them feel welcome. 5. What direction do you think food is going in? I hope it�s not going down the deconstructed path. I like good, hearty, wholesome food � and that�s what we try to cook here. It�s your home for a day and a half. Molecular gastronomy has its place, and it�s good inspiration for decoration, but I think it�s important that you get what you see � your mind sees food and then communicates to you what it�ll taste like. If it looks like a steak it should taste like a steak. That�s what I believe, anyway.